Bhuribai is very closely connected with me. I have come to know thousands of men, thousands of women, but Bhuribai was unique among them. Bhuribai’s Mahaparinirvana – her death attaining the highest liberation – happened just recently. Count her with Meera, Rabiya, Sahajo, Daya – she is qualified to be among these few selected women. But as she was illiterate, perhaps her name won’t ever become known. She was a villager; she belonged to the country people of Rajasthan. But her genius was unique; without knowing scripture she knew the truth. It was my first camp. Bhuribai was a participant in it. Later she also participated in other camps. Not for meditation, because she had attained meditation. No, she just enjoyed being near me. She asked no question, I gave no answer. She had nothing to ask, there was no need to answer. But she used to come, bringing a fresh breeze along with her. She became inwardly connected to me in the very first camp. It happened. It wasn’t said, it wasn’t heard. The real thing happened! She attended the first lecture… the words and events of the camp that Bhuribai participated in are collected in a book called The Path of Self-Realization. It was the first camp; only fifty people participated. It was in Muchala Mahavir, an isolated uninhabited ruin in far Rajasthan. Kalidas Bhatiya, a High Court advocate, was with Bhuribai. He served her. He had left all: law practice, law court. He washed Bhuribai’s clothes, he massaged her feet. Bhuribai was aged, some seventy years old. Silence the means, silence the end, in silence, silence permeates. Silence, the knowing of all knowing: understand it, you become silence. Silence is the means; silence is the end, in silence only silence permeates. If you would understand, if you want to understand, then only one thing is worth understanding – silence. The moment you know it, you become silent. There is nothing else to do: Silence, the knowing of all knowing. At the next camp her disciples waited eagerly, with great excitement. She had put the book in a chest and had it sealed. She had a lock put on it and brought the key. Her disciples lifted the chest on their heads and brought it to me. They asked me to open it. I opened it and took out a booklet, a tiny little booklet of some ten or fifteen pages; and tiny – about three inches long by two inches wide. And black pages without any white! I said, “Bhuribai, you have written well. Other people write, but they blacken the page only a little bit. You wrote so there’s no white left at all.” She had written and written and written. Her love was amazing. She had her own way, unique! She doesn’t have to return to this world. She has gone forever. In silence, silence permeates. She has dissolved. The river has diffused into the ocean. She didn’t do anything, she just remained silent. And whoever went to her house she served them. She served them in every way – and silently, quietly. 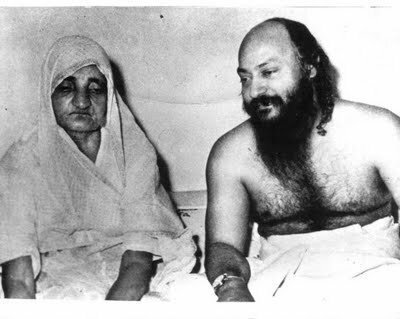 From a Hindi discourse given on September 11, 1980 pm in Osho Commune International, India. Translated from: JYUN THA TYUN THARAYA. Published in Osho Times International August 16, 1991.